New to UCA? Give us five days (or longer) and together we can help you become an even better student! Being a successful college student requires different skills than you needed in high school. UCA’s Summer Start programs will help you learn what you need to succeed before you even begin your first semester. Commit yourself to just five days of intensive skills and content development, and your grades will thank you. YOU will thank you! Want to do even more? Then check out our five-week programs. Getting a head start on your college courses and college credit is a great way to make sure you graduate on time. It also allows you a chance to get familiar with UCA before the full academic year begins. 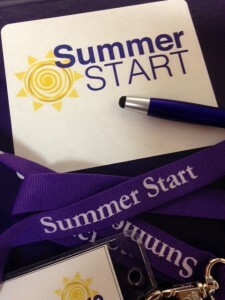 Summer Start offers two five-week, six-credit programs this year to help you start early, start right. Our new Summer Advantage program can also provide Pell Grant recipients additional funds toward Math4Success, Chem4Success, or any on-campus Summer II course. Planning to major in the sciences, but want some additional preparation in Chemistry? The five-week Chem4Success program offers a summer review of basic chemistry concepts and terms that results in credit hours toward your degree and better preparation for the Fall semester. As part of the program, you will also enroll in our first-year seminar, Journeys to Success, which will prepare you to succeed in all of your Fall courses. Live on campus in summer housing, or commute. Your choice! Chem4Success students enroll in CHEM 1301 and ACAD 1300 (Journeys to Success). It’s intense, but in five weeks you will have earned six hours of college credit, and you’ll be ready for your first year! Students in this program may qualify for financial aid with submission of the 2018-2019 FAFSA by June 30, 2019. A lot of majors require students to complete College Algebra, including business majors. If you want an opportunity to focus on completing this requirement early, then Math4Success is for you! This five-week summer program allows you to complete College Algebra, utilize UCA’s Tutoring Services, and enroll in our first-year seminar, Journeys to Success. Live on campus in summer housing, or commute. Your choice! Math4Success students enroll in MATH 1390 (College Algebra) and ACAD 1300 (Journeys to Success). Two courses in five weeks can be intense, but you will have earned six hours of college credit when you are done, and you’ll be ready for your first year! This summer, UCA is offering financial assistance to incoming, first-year, Pell Grant-eligible students who enroll in a Summer II on-campus course at UCA. Want an early look at UCA? 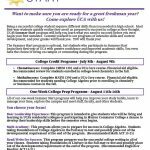 Want to get started on your college degree this summer? Check out the courses available, and then contact us by submitting the registration form. Pell Grant recipients who are interested in Chem4Success or Math4Success may also be eligible for Summer Advantage assistance toward one course. 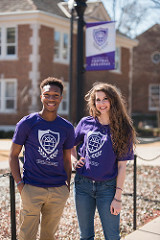 UCA’s one-week Summer Start is an early-arrival bridge program designed to help our new Bears transition from high school to a successful freshman year. As part of Summer Start, you have opportunities to improve your study strategies and get to know the UCA campus early! This focus area is designed for students scoring between 15-21 on the ACT Math. At the end of the week, you will have the opportunity to test out of developmental requirements, if required. Students scoring between 15-21 on the ACT English or ACT Reading should enroll in our Read/Write to Succeed focus area. At the end of Summer Start, you’ll have the opportunity to test out of developmental requirements, if required. This focus area is specifically for students living in a Residential College or who want to be a part of the Minton Commuter College.